Happy Friday to you all and welcome to our next new challenge pit stop. 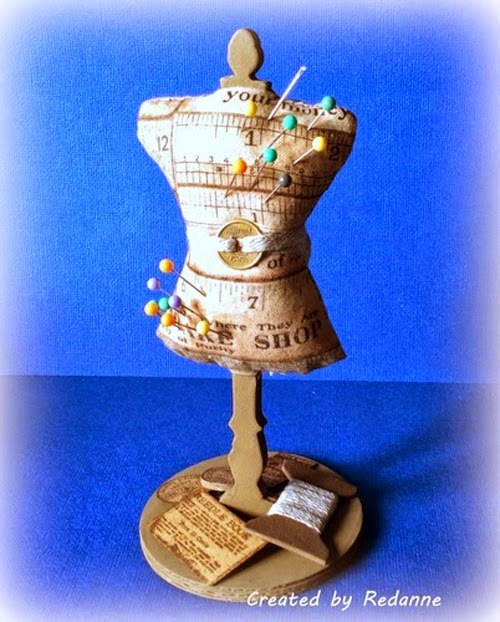 Today we are asking you to think about how you can include the theme of sewing or something sewing related in a project with some Tim inspiration added in. It's simple - a sewing inspired creation, any style - it could be that you use a Tim technique, use some of his products, maybe you will case one of his tags but make it sewing based, you choose but please make it clear what the Tim influence is as so many people disqualify themselves from being able to win the prize when we are not sure how the entry fits to our challenge and rules. Be adventurous and make whatever you like, it doesn't have to include real sewing but must be focused within that theme. So what are you waiting for? Let's take a look at what the amazing Creative Guides have been inspired to make. I was inspired to use plain cotton fabric to make a journal. The background is layered with distress inks and gesso with a Tim stencil and a text stamp. 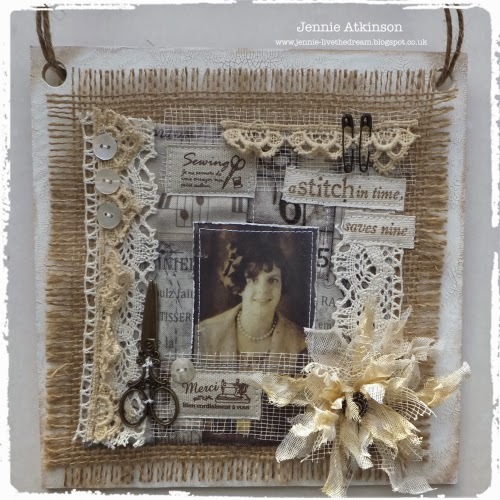 The collage incorporates eclectic elements fabric images, ideaology and personal items as well as Tim's gorgeous layered butterfly die and texture fade, if you love using crinoline I'm sure you'll love the texture and dimension created using them together. I explain the whole process for making this over at Bumblebees and Butterflies including the materials used to make the flexible covers. Brenda's challenge was just the push I needed to sew up this sweet little fabric basket using a free tutorial I found on line several years ago (but never made!) and some of Tim's wonderful Eclectic Elements fabric pieces. Then I just had to dress it up a bit using several Idea-ology findings! You can see just how I made and decorated my fabric basket on my blog post here. I'm "sew" glad Brenda chose this theme for the challenge, one of my favorites. I'm sharing a card made for my Mom's birthday. 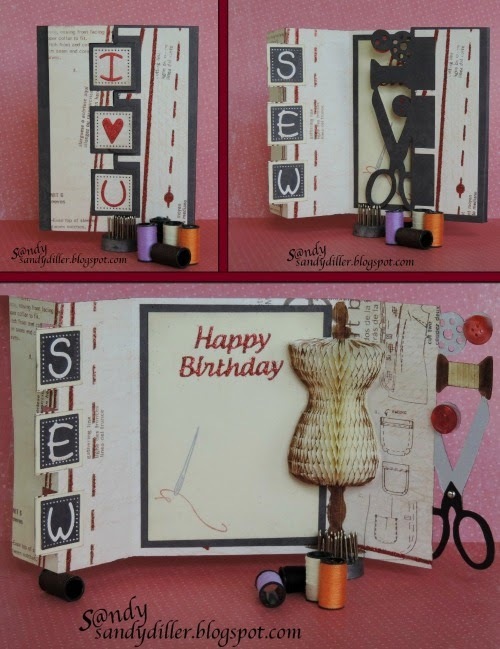 There can be no doubt about Tim's influence with the Sewing Room Die and the Sewing Edge Die used here. Please stop by my blog here to see all the details. I have taken Brenda's challenge to make a sewing inspired project quite literally by creating a pin cushion using Tim Holtz dies and fabric. If you would like to see what the back of the dress form holds you can check it out here on my blog. I decided to make a sewing box, which I gave to my daughter to take to London with her. Using Tim's papers and an eclectic mix of goodies and techniques to decorate it. 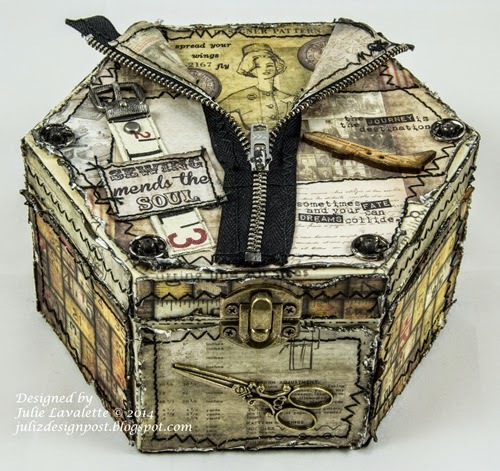 To see how I made this box and what's inside it, please pop over to my blog Juliz Design Post. Tim's Eclectic Elements fabric was the inspiration for my textile hanging but I got quite carried away adding lace and other sewing ephemera! 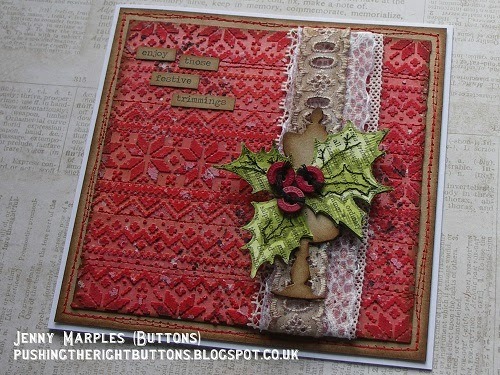 I had great fun making this tattered flower from crinoline and scrim using the Tattered Poinsettia die - it is not just for Christmas! Join me on my blog if you want to see more details. So now we are looking forward to seeing what has inspired you and how you take this theme forward. Come take this trip with us and join in the fun. Leave your entry link below and we will be taking a stop at your blog to leave some love. what wonderful 'sewing' inspiration here ladies! so many creative ways to work the theme into a project! Stunning Projects from everyone which I am sure will inspire our followers to join in this challenge. Good luck to everyone entering. Thanks for the great theme Brenda. The team did an amazing job - always so nice to see how everyone has an entirely different idea and how they bring it to life. Loving all the samples from the team and looking forward to seeing how everyone interprets the challenge. A great challenge and wonderful exhibits here. Learnt so much visiting all your blogs. Gorgeous projects from the whole team. just wish I could sew....once again I will say,I hope I find time to join in - one day I will actually do it! A great theme and you ladies have created wonderful projects! Beautiful inspiration from the DT. Great idea's for the non-sewers. WOW WOW WOW!! 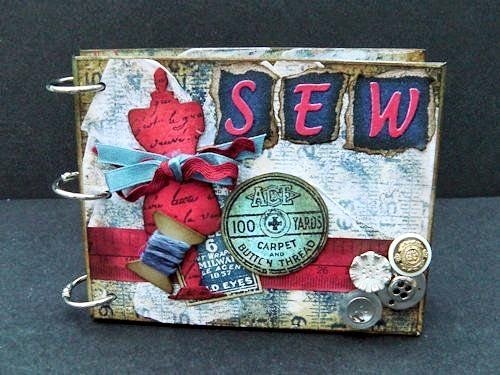 Ab-SEW-lutely amazing creations!! WOW!!! 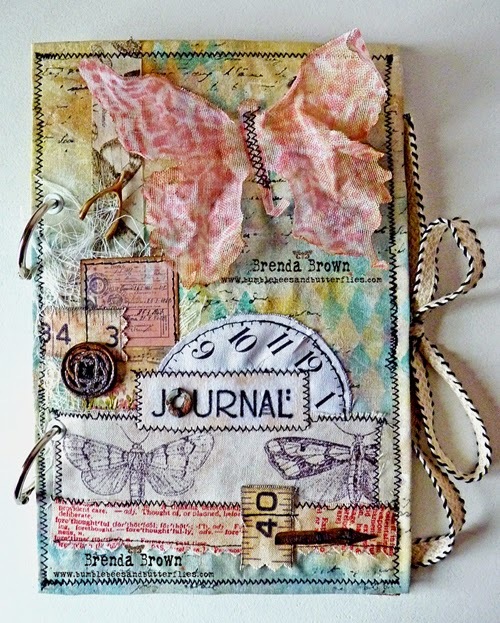 XOXO-Shari T.
A great theme for the challenge Brenda and wow how the team have taken this on. What amazing projects - so many ideas and details to keep coming back to over and again. Thank you for the beautiful inspiration and thanks for the fun challenge! Great creations for inspiration! thanks ladies! What a fun challenge! There's quite a variety of takes on the theme, and gorgeous inspirational pieces!